Remove your makeup an oil-free, mineral rich cleansing water. A cleansing water is very gentle on your skin. Take extra care around your eyes. 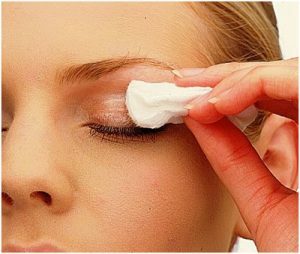 If there is any makeup that is still left behind, use a cream cleanser. Use reviving eye masks to hydrate your eye area. Slather on a layer of rich moisturizer – don’t forget to do your neck and hands. Dab on an anti-aging eye and lip cream to help soften crows feet and lines around the mouth. And finally, give your hands and body some pampering too. Choose a dense, rich cream to slather on. Now, you are ready for your beauty sleep! Needless to say, partying can end up with you getting home very late and leave you not looking your best. To feel good and look good the most important step is to get enough sleep after the party. This may mean sleeping in or taking it easy the day after to allow your body to rejuvenate. If you are feeling stressed and tired it will impact on how you feel. Getting sleep and doing things that are calming (such as running a fragrant calming bath) or doing soothing activities are just a few things you can do to feel back to normal. Whether you had a few too many drinks or just a lot of dancing you are likely to be left rather dehydrated – drinking water throughout the day will help your skin and overall body feel and look healthy. Something else that may help is to eat light meals throughout the following day. At parties, it is usual for one to overeat and eat food that is not the best for the gut. Eating light meals that are easily digestible will help your body recuperate. Beauty and well being go hand in hand.